For other uses, see Brody (disambiguation). Brody (Ukrainian: Броди, Polish: Brody, Yiddish: בראָד Brod) is a city in Lviv Oblast (region) of western Ukraine. 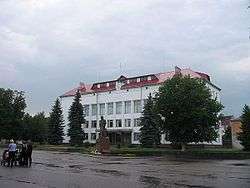 It is the administrative center of Brody Raion (district), and is located in the valley of the upper Styr River, approximately 90 kilometres (56 miles) northeast of the oblast capital, Lviv. Population: 23,713 (2016 est.). Brody is the junction of the Druzhba and Odessa–Brody oil pipelines. The first mention of a settlement on the site of Brody is dated 1084 (Instructions by Volodymyr Monomach). It is believed to have been destroyed by Batu Khan in 1241. From 1441 Brody was the property of different feudal families (Jan Sieniński; from 1511, Kamieniecki). Brody was granted Magdeburg rights and city status in 1584. At this time it was known under the name Lubicz (Любич, Polish: Lubicz) that gave name to the Lubicz coat of arms of the owner, Stanisław Żółkiewski (not to be confused with Lubech, Lubecz). 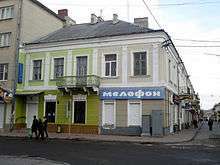 Since the 17th century, the city has been populated not only by Ukrainians and Poles, but also a significant number of Jews (70% of the town's population), Armenians, and Greeks. From 1629, the city became the property of Stanisław Koniecpolski, who ordered the construction of Brody Castle (1630–1635). The castle, or rather the fortress, was designed by the French military engineer Guillaume Le Vasseur de Beauplan. In 1648, during the Cossack insurrection, the castle took eight weeks for Bohdan Khmelnytsky to capture. Notably, according to the book History of the Rus, the town′s Jewish population was spared after the sack. The Jews of Brody were found not to have been engaged in maltreatment of the Orthodox Christian (Rus) population and were only required to pay a "moderate tribute" in kind. The town was the site of heavy destruction by both Polish and Russian forces in the Polish-Soviet War of 1920, and is described extensively in stories of the Red Cavalry by Isaac Babel. 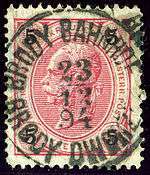 After the conflict, it became part of Second Polish Republic and was located in the Tarnopol Voivodeship. Brody was an important military base, with the Kresowa Cavalry Brigade headquarters established there. After the outbreak of World War II in September 1939, Brody was occupied by the Red Army. Between June 26 and June 30, 1941 a tank battle was fought nearby between the German Panzer Group 1 and five Soviet mechanized corps with heavy losses on both sides. The tower of former district court building in Brody. 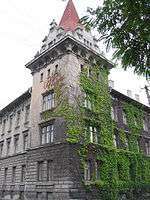 Today it houses Pedagogical College. 1890 n. a. n. a. n. a. 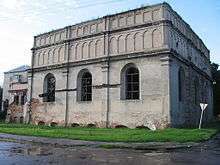 The old synagogue (ruins) of Brody has been in the process of renovation by the local government since World War II. A crossroads and a Jewish trade center in the 19th century, the city is considered to be one of the shtetls. It was particularly famous for the Brodersänger or Broder singers, who were among the first to publicly perform Yiddish songs outside of Purim plays and wedding parties. The promulgation of the May Laws, and the massive exodus of Russian Jews which was its result, took the leaders of Western Jewry completely by surprise. Throughout 1881, hundreds of immigrants kept arriving in Brody daily. Their arrival placed the existing Austrian and German influenced ethnic Jews in a quandary. The comfortable middle-class Jewish community of Central and Western Europe looked instinctively to the Alliance Israélite Universelle, the world's largest and most respected Jewish philanthropic agency, to bring order out of chaos, to cope with the huge influx of newcomers. Throughout centuries of Jewish life in Brody until the murderous events of the Holocaust, Jews and Gentiles lived a mostly segregated life, with distinct and separate social as well as religious life. When German troops occupied the city on July 1, 1941 the Jewish population of some 9,000 was forced to wear an arm-band with the yellow badge. 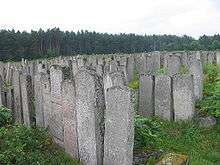 Two hundred fifty intellectuals were arrested on July 15, 1941 and shot two days later at the Jewish cemetery, after being brutally tortured. Encouraged by German occupation authorities, the Ukrainian population started a pogrom in August 1941, looting Jewish possessions. The Judenrat had to provide labor for repairs and maintenance on the roads and bridges as well as for work in army depots. From December 1941 young people were arrested on the streets and sent to forced labor camps in the vicinity. In September 1942 the Aktion Reinhardt started in Brody, leaving 300 people dead. Two thousand people were deported to Bełżec where they would be murdered in the gas chambers. In December 1942 the German occupiers forced the Jewish population to resettle in a ghetto inside the town, where 6,000 people lived in January 1943. During 1943, Aktion Reinhardt was continued with thousands being killed in the nearby woods in March and April, the Ghetto being liquidated on May 21, 1943. More than 3,000 inhabitants were deported, presumably to Majdanek, but hundreds had already been killed in the Ghetto. Many houses were set on fire to drive out those who had remained hidden there. During July–August 1944, Brody and nearby areas saw the battles of the strategically important Lvov-Sandomierz Operation (a.k.a. Brodovkiy Kotel) where the Soviet army successfully encircled and destroyed German forces. During the Cold War, Brody air base served Soviet Air Force regiments, while the city was noticeably militarized. 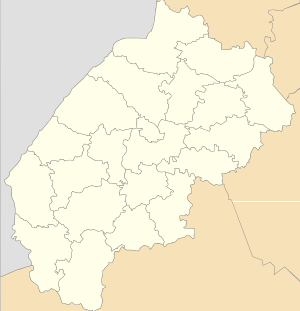 Parts of the city to this day are being referred to as Bili Kazarmy (the White Barracks) and as Chervoni Kazarmy (the Red Barracks). The Brody museum of history and district ethnography was founded in 2001. Leo Kanner, Austrian psychiatrist and physician known for his work related to autism. Dmytro Pyluk (1900–1985), Ukrainian painter and film producer. Daniel Abraham Yanofsky, chess player. See German-language article. ↑ "Чисельність наявного населення України (Actual population of Ukraine)" (PDF) (in Ukrainian). State Statistics Service of Ukraine. Retrieved 19 July 2016. Wikisource has the text of the 1911 Encyclopædia Britannica article Brody. Wikimedia Commons has media related to Brody. Live webcam of the Market Square (ploshcha Rynok).